I've been picking at this for a few weeks, thought I would share the progress. I was able to find an early Apple II Rev. 0 board a few months back, (replica I assume) and thought I would build up the board. I used vintage gold pin Augat sockets instead of the Robinson-Nugent sockets Apple used back in the day. I'm partial to Augats, as I've been using them for decades and they've proven to be quite reliable over time. I used vintage Augats that were (back in the day) color-coded. Red being 14-pin and Green being 16-pin. That idea never really caught on, I'm guessing because folks were used to plain black. There are some obvious differences besides the sockets that show, such as many of the IC's are dated in the 80'sand 90's, but I was able to get a good set of the gold 16K memory chips and an original late production ceramic & gold Rockwell 6502 Microprocessor. The Integer basic chips are originals and I've added the Inspector/Dr. Watson pair to compliment the setup. Memory select jumpers were hand made. I found some on eBay but the seller wants $50 for a set of 3, so I decided to make my own. (not that hard & MUCH less expensive) The board is fully functional and starts up 'strangely' as designed. (Powers up with screen garbage, hit Reset for prompt, then hit Ctrl-B for Integer Basic) Pretty primitive as Apple ]['s go, but kinda neat at the same time. Thinking about modding up a case for it with no vents. This is a clone PCB made from my CAD files, which I released. not too long ago. The smiley face on the back, is a dead give-away. You can put anything you want there, or leave it blank. A blank original Apple II rev 0 board would be an extrodinary find. I know of two originals: one is in the Stanford University library colllection. When I investigated, some years ago, it was incorrectly listed as an Apple 1 circuit board, . The other is with Lonnie Mimm's Computer Museum of America. one other subtle power up bug - the rev zero's may drop the first character that you type on the keyboard. If you add a disk controller, which has a power up reset circuit, and Autostart ROMs, it boots pretty much acts the same as later versions. I remember you making the CAD file a few years back. Someone posted this on eBay and I bought it with the intent of building one up. I knew this was a replica (stated in my initial post here) but it looks like a well made one. The finished product looks quite nice. I'm sure you put in considerable amount of time replicating this. My next task is to modify a case to block the air vents. You know, make things worse. :-D Still, fun to do. I've got to sort out how to make an old looking Power key, as folks are getting small fortunes for those keyboards these days. 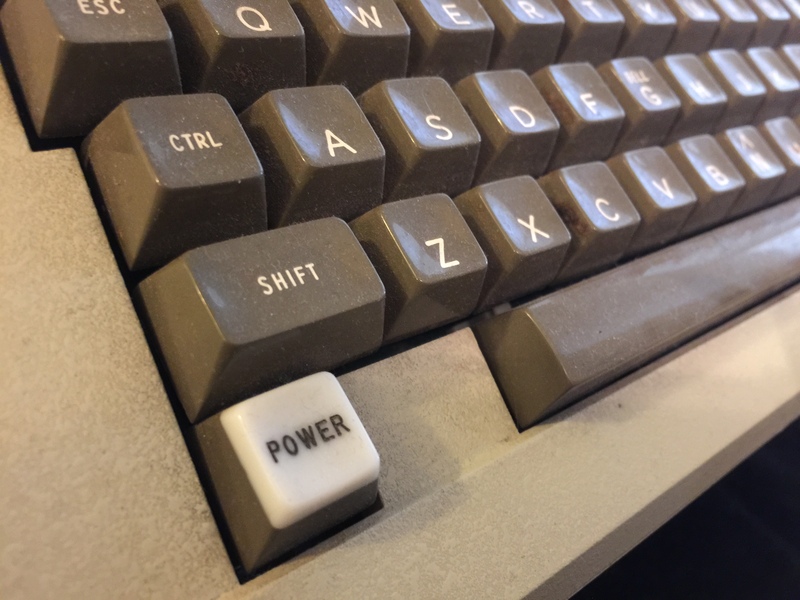 Someone was making good repros of the power light cover for early keyboards a few years ago but I haven't seen anything but 3D printed ones lately. Those are perfectly functional and look O.K. from a distance but up close you can usually tell if things are 3D printed vs. injection molded. Can someone out there in Fritter land post a rather large, clear photo of the old power light, top, side and bottom? Looks quite nice in the photo! I'm glad to see others are actually doing what I'm thinking ... Nice work.